In an email titled “What is this car?” a reader named Eric sent us spy shots of a car sitting just outside of his workplace in Pittsburgh. The answer to his email title is almost certainly the upcoming Cadillac CT5, a sedan slated to replace the CTS and ATS. But the real question that should be in the subject line is: What’s with that fake Dodge Charger light covering the rear end? “We have to rebalance our sedan portfolio,” Johan de Nysschen told Reuters in interview, offering new details about the strategy. Cadillac will not directly replace the current XTS, CTS or ATS sedans when they end their life cycles in 2019, he said. Instead, Cadillac will use a single new car called the CT5 to appeal to consumers shopping for sedans priced between $35,000 and $45,000. New versions of the CT6 sedan will be offered to customers who want a larger car starting at $50,000. We all know crossovers are Cadillac’s moneymaker for the time being, but it still needs some sedans. And it’s hoping the CT5 will do double-duty. Now that we got that out of the way, it’s time to address part of Eric’s email. 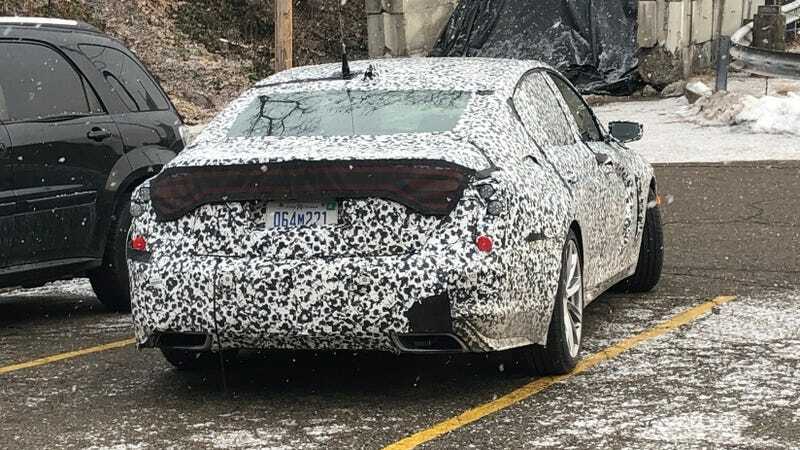 Specifically, this one: “The tail lights are deceiving, as the outside lights up and the inside looks to be fake?” Eric was kind enough to send a picture to help explain the confusion. There are, of course, other cars that have similar taillights (like the Lincoln Continental), but come on—the taillight bra on this CT5 is a dead ringer for the Charger’s rear light design. I mean, just look above at the lights within the “Racetrack” taillight—there’s a thicker one on top on each side sitting on a thin light sliver. It matches what’s on the Cadillac mule. Between that, and the telephone shape to the “Racetrack” full-width light, it seems apparent that Cadillac—for whatever reason—put a fake Dodge Charger taillight over top of what I assume will be lights on the CT5's trunk lid. I have no idea why. Perhaps for fun? Or maybe to throw people off to get them to think this is an FCA product and not a Caddy? Or maybe I’m missing something—who knows. For now, it just seems a bit odd. But fun, in a way.